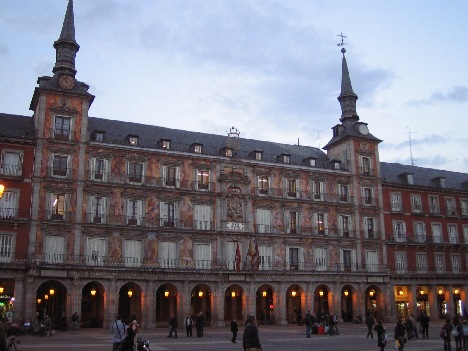 Madrids Plaza Mayor is the starting point for any visit to the historical "old town" Madrid. Translated simply the plazas name means "oldest square" or "grandest square" although with dimensions of 129 x 94 m (130523 ft²) it could also be called "the big square"! ...and all of this accompanied by various photos of the plaza Mayor. The plaza´s origin is that of the old Plaza del Arrabal which was the meeting point for the towns traders with those who came from the then larger city of Toledo. After King Felipe II moved the regions government from Toledo to Madrid in 1561 he commisioned various improvements to the Madrid landscape. In 1580 it was the turn of the Plaza to be considered and the demolition of the old Casas de manzanas(Houses of apples) started in the same year. 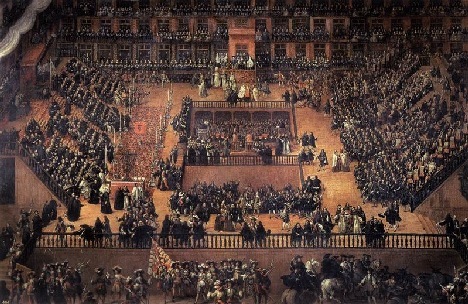 It took until 1590 before the first "side" of the plaza started to be constructed and indeed it wasn´t until the reign of Felipe III that the order was given to enclose the square on all four sides. In common with many buildings in medieval Europe the five story accomodation surrounding the Plaza Mayor were constructed with wooden floor beams and straw bedding which were susceptible to fire from the torches and fireplaces used to light and heat the buildings. Between 1631 and 1790 three major fires devestated the Plaza. In the first two instances (1631 & 1670) the plaza was rebuilt almost exactly to the original design however after the fire of 1790 the architect in charge of the restoration decided to reduce the structure to its present form of just three stories. Nowadays Madrids main square is almost entirely given over to the tourist industry with numerous Tapas Bars and Restaurants in the alcoves, underneath the arches or sprawling out into the square itself. Do be warned that the Restaurants charge "Tourist prices" whilst the bars are a little more resonable. One of the restaurants "Sabrino de Botin" is officially recognised by the Guiness book of records as being the worlds oldest restaurant having been founded in 1725!! 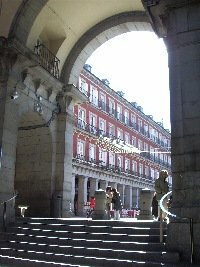 Located underneath the arches are numerous Souvenir shops, stret theater, portrait painters as well as the offices of Tourist information and on Sundays also plays host to Madrids Stamp and Coin market. For the "fiestas" (festivals) of San Isidro and Semana santa (Easter) various religious ceremonies are performed "open air" and during the month of December the plaza plays host to the more commercial festival that is Xmas with Madrids traditional Christmas market taking center stage. The christmas market actually dates back to 1860 and is normally accompanied by various acts and theater. Executions, Depending on the form of execution the stage would be located in a different part of the square. Methods varied between: Hanging, Beheading, Clubbing and Stabbing.